Below you fill find all funeral homes and cemeteries in or near Wahpeton. Suburbs of Wahpeton: Dwight, Galchutt, Great Bend, ND State College of Science. 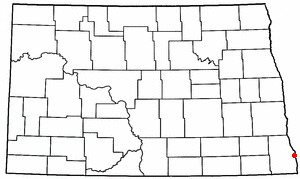 Wahpeton is also known as: Richland County / Wahpeton city. Their current mayor is Mayor Meryl Hansey. Zip codes in the city: 58074, 58075, 58076. Some of the notable people born here have been: (sam anderson), (steve myhra), (clark williams (politician)), (jerome g. miller), and (ryan smith (canadian football)). Wahpeton (/ˈwɑːpɨtən/ WAH-pə-tən) is a city in Richland County, North Dakota, United States. It is the county seat of Richland County and the U.S. Census Bureau estimated 2013 population was 7,853. Wahpeton was founded in 1869 and is the principal city of the Wahpeton Micropolitan Statistical Area, which includes all of Richland County, North Dakota and Wilkin County, Minnesota.Wahpeton's twin city is Breckenridge, Minnesota. The Bois de Sioux River and the Otter Tail River join at Wahpeton and Breckenridge to form the Red River of the North.The North Dakota State College of Science is located in Wahpeton. The local newspaper is the Wahpeton Daily News. It was disclosed by The Herald on August 21st, 2018 that Alan James "Al" Fruetel passed on in Washington. Fruetel was 73 years old and was born in Wahpeton, ND. Send flowers to share your condolences and honor Alan James "Al"'s life. It was reported on July 27th, 2018 that Theodore "Ted" Hein perished in Columbia Heights, District of Columbia. Hein was 96 years old and was born in Wahpeton, ND. Send flowers to express your sorrow and honor Theodore "Ted"'s life. It was noted by Chippewa Herald on January 9th, 2018 that Jerome W "Jerry" Hayes perished in Chippewa Falls, Wisconsin. Hayes was 80 years old and was born in Wahpeton, ND. Send flowers to express your sorrow and honor Jerome W "Jerry"'s life. It was reported by The News Tribune on December 5th, 2017 that Terry Wayne Dr "Torg" Torgenrud died in Washington. Torgenrud was 75 years old and was born in Wahpeton, ND. Send flowers to share your condolences and honor Terry Wayne Dr "Torg"'s life. It was disclosed on June 26th, 2017 that Terry L Cordero perished in Wahpeton, North Dakota. Cordero was 61 years old. Send flowers to express your sorrow and honor Terry L's life. It was disclosed by The Bismarck Tribune on February 2nd, 2017 that Ryan Rosaaen passed on in Wahpeton, North Dakota. Rosaaen was 21 years old and was born in Roseau, MN. Send flowers to express your sorrow and honor Ryan's life. It was noted on August 9th, 2016 that Pauline Mohs perished in Wahpeton, North Dakota. Mohs was 75 years old. Send flowers to express your sympathy and honor Pauline's life. It was noted by The Daily Herald on May 8th, 2016 that Elizabeth S "Betty" Fay (Gilles) died in Barrington, Illinois. Ms. Fay was 87 years old and was born in Wahpeton, ND. Send flowers to express your sympathy and honor Elizabeth S "Betty"'s life. It was revealed by The Bismarck Tribune on April 12th, 2016 that Lillian E "Dicki" Haman perished in Wahpeton, North Dakota. Haman was 83 years old. Send flowers to express your sorrow and honor Lillian E "Dicki"'s life. It was written by Tri-City Herald on March 23rd, 2016 that Lavonne Dorothy Rube (Neitzel) passed on in Kennewick, Washington. Ms. Rube was 70 years old and was born in Wahpeton, ND. Send flowers to express your sorrow and honor Lavonne Dorothy's life. Its frontier had, years before, passed further west. An apt name considering its founder and the fertile quality of the soil. In 1889 the Red River Valley University was established later to become the North Dakota State School of Science. Rogers was commander of Fort Michilimackinac, the British fort at Mackinaw City, Michigan which protected the passage between Lake Michigan and Lake Huron. It has been through this half of the Twentieth Century that the Red River Valley has earned its reputation as one of the richest agricultural belts in the nation. The official website for the city of Wahpeton is http://www.wahpeton.com. The funeral service will be at 10 ... Mitzel on their farm northeast of Wahpeton. Ivan graduated from Wahpeton High School and attended North Dakota State School of Science. After graduation he worked as a mechanic at the Wahpeton Chevrolet garage. Listing all funeral homes in Wahpeton, North Dakota so you can easily send flowers to any location (same day delivery) or find any funeral service. We work with local florists and flower shops to offer same day delivery. You will find budget sympathy flowers in Wahpeton here. Our funeral flowers are cheap in price but not in value.